New Cookbook Out from Ted Reader - You Could Win It! Kara got in touch with me about Ted Reader's newest cookbook. She didn't have to sell me. I've known Teddy for a while. We're Facebook friends, and someone gave me some of his sauces some time back. His pineapple barbecue sauce was so yummy and smelled so good the people grilling beside me at the beach came over to ask why our food smelled so much better. I still love that Ted Reader pineapple sauce. If you'd like to see what the buzz is with this Canadian BBQ guru, then now is your chance. Kara sent me Gastro Grilling to check out and some grilling seasoning (and a review - honest good or bad). You can get the book and some flavorings too free with my latest Barbecue Master giveaway sponsored by Ted and his hard working marketing group. How Do You Enter to Win the BBQ CookBook and Seasonings? I keep my contests low tech and no spam. I don't like to jump through hoops, and I hate spam, so I don't do that to my readers (and thank you all for making my Barbecue Master blog so successful). Just comment in my comment section and tell me why you'd like to win this great prize. Also leave some way to let you know if you win. I don't need your firstborn, but be sure I have some clue as far as getting in touch. I don't add you to lists or anything other than contact the winner and the company who will send the prize directly, so it doesn't get run through the mail twice. Some onliners love extra entries, so I'll add a couple of those too. You don't have to do anything extra. The comment gets your name in the hat. These extras just give you extra slips. Do add a new comment to tell me about extra entries. I don't want you having to PM or hashtag me all over the internet. Just put something like: Extra entry - tweeted etc. (and again some kind of contact). So, here's what you can do . . .
Visit Ted Readers FB page and let me know what you see. I first said to leave a "Cyndi said hi" message on his page, but he is maxed on the FB limit. Tweet the barbecue gift contest. Google + the contest. Does anyone G plus? Some I'm sure. One selfish request - subscribe to my blog, so you won't miss out on future contests. That's on the right bar. I don't see the info. Promise. You get an email by way of Google, but you can see from the title if you're interested (which I hope you are). That gives you the basic comment entry and five more if you are the high achiever type. It only takes one, and I've certainly had a one entry person win. My last class day at the college is May 5th (2014) at 10 pm EST, so I'll make that the deadline, so I can celebrate along with you. *Please not that I am not an auto blogger. I check every comment, so you won't see your comment immediately, unless I'm online. I'm not a control freak. If you saw some of the dirty stuff and spam people put up, you would know why I check to make sure things on my blog are the real deal. I'll make sure you're entered, but it may take me a few hours especially if I'm sleeping. I love my ZZZZs. Good luck. This is a very nice free giveaway prize! Love Ted writings and love to have his new book along with trying his spices. I have a lot of Family and Friends that enjoy my Q. Always looking for new ideas to try and get "That's Awesome Q" reaction. I am a huge Rub Fan. I like when folks tell me "I did not need any sauce on that" The flavors and smoke do a Happy Dance on your tongue. I'm always looking for new recipe's, techniques and rubs. FIngers crossed that I win this one. I would love to win this awesome prize because after this very long and brutal Wisconsin winter, I have never been more excited to grill out this summer. I would love to try out these recipes and sauces to really add some extra flavor this summer to our grill outs. I want to take full advantage of the sunshine more than ever and this would really help with that! You gotta love Teddy's stuff ! Ted's postings of food have been a huge inspiration to my cooking and this books looks fantastic to continue my meaty, outrageous, culinary journey. I love all of, and own, all of your previous cookbooks. I also love the fact that you take the time to comment back to people on your facebook account. I would love to win this book, I love to BBQ, and I love to fire up my smoker, but sadly ,Im not very good at either. Ted's books and even his pics on FB look Mighty Tasty and would help me step my game up! I'm a bbq freak and live in the Netherlands, I follow Ted daily on facebook and his meals are out of this world, sure would like to practise them at home !! Wow what a prize to add to my Ted Reader collection..along with my signed copy of "Beerliscious" received from Ted at a BBQ comp...it did cost me a plate of ribs! Always looking for new ideas to try on my new grill...Ted's new book would be great to push me in the right direction. As a fellow Canadian, it's great to see Ted doing do well with his BBQ food at contests throughout the BBQ belt! Love cooking his stuff, but haven't got the new book yet! Why should I win? Because I respect Ted is the "King of the Q" - dynamite BBQ! 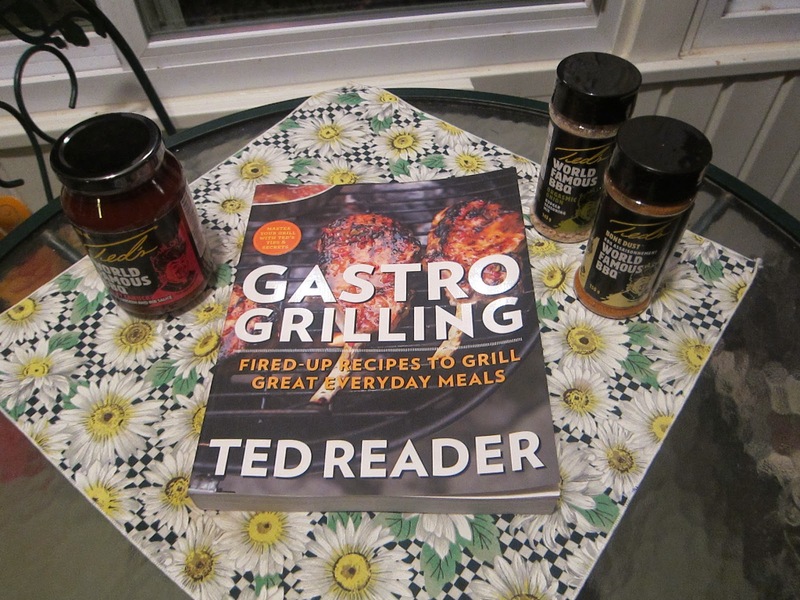 Ted's a artist who works in charcoal and marinated meats...any serious BBQ'er should have his books on hand. Looks tasty!! Please enter me in the contest. I love to grill and am up for new spices! On his Facebook page, I see "I'd like to BBQ something I haven't tried from Chef Ted Reader's GastroGrilling Cookbook." i would like to win this for my boyfriend for his birthday. thanks! Upon visiting your Facebook page, all I saw was wonderful meat to be BBQ'd. I love to BBQ all year round even in the snow. I shared this contest on Facebook. I Google +'d the contest. Thank you all so much for entering. Keep an eye out. I have a few contests, and they are on the level and spam free. The winner is Dan B. I will go look him up now to get his info for the company. Congrats to Dan. Thanks for sharing the recipe, I will try to make it.